Evie was born in Jamaica, New York to M. Evelyn (Stryker) and William R. Pabst, Sr. When she was young, her family drove from Jamaica, took the Clason Point Ferry, and arrived at Peach Lake for summer weekends. She met her husband Raymond J. Janus while in high school. Once she graduated, she married Ray in 1943 during WW II. She was very proud of the fact that he was an MP in the Army, who landed on Omaha Beach, D+4. In 1944, Evelyn Jr (Sunny) was born and when Ray returned in 1945, the family was reunited. Raymond, Jr. (Bud) was born in 1948 in Jamaica where they initially lived. In 1951 they moved to Sunset Place at Peach Lake where Lorraine (Rainie) and William (Billy) were born. Evie was involved as a Sunday school teacher, as well as a Girl Scout and Cub Scout leader. When her children went off to school, she worked at a local dress shop and summer stock theater where she satisfied her interests in fashion and sewing. Evie also worked at AT&T as a computer operator and as a bus driver for the Katonah-Lewisboro Elementary School. She had great enthusiasm for getting out very early in the morning to see nature and interact with the children who rode her bus. 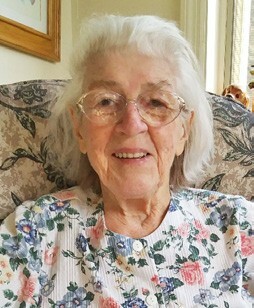 Evie was also the owner operator of Pabst Water Company, Inc., established by her father, which has provided water service for the Northern Westchester Country Club since the early 1950s. As a member of St. James Episcopal Church, she served on the altar guild for many years, as well as participated in the Dorcas Society and F.I.S.H. Her most prized possessions were her family and her mother’s oil paintings of local scenery. She loved life at the Lake where she resided until her death in 2018. She was pre-deceased by her parents, M. Evelyn and William R. Pabst, Sr.; her four brothers, Harold, William, Jr., David, and Howard; and her husband, Raymond J Janus, Sr. She is survived by her four children, Evelyn L. Dickerson (Joe R.), Raymond J. Janus, Jr. (Patrice A. Ryan), Lorraine L. Janus (Norman B. Hathaway), and William A. Janus (Patricia J. Browne) and her three grandsons Todd W., Peter F., and Dylan A. Janus. There will be a gathering of family and friends at the St. James Parish Village Hall in North Salem at 1 p.m. followed by a graveside interment service at Peach Pond Cemetery on Oct. 7, 2018. In lieu of flowers, the family requests donations in memory of Evie to VNA of Hudson Valley, Hospice Care (914.666.7616 ext. 1210) or the North Salem Volunteer Ambulance Corps (914.277.4944).